People should know better by now. Do they really want to display their ignorance of history, archaeology, ancient literature and so on by pretending that Jesus himself never existed? Dr. Phil Fernandes easily refutes that silliness. Get comfy, it's over an hour. But well worth it. Atheist Hypocrisy and the "Jesus Myth"
Pope Richard Dawkins leads the charge against creationists, and his non-thinking disciples copy-n-paste his obstreperous rhetoric in an effort to appear just as wise as him. Unfortunately, he does not appear wise, and their lazy efforts to attack creationists with bad parroting serve to humiliate the lot of them even further. In this case, he does/does not believe in the "Jesus Myth" nonsense. Of course, when the facts do not fit with reality, emotional attacks must suffice for misotheists. Sorry, Sigmund, you'll have to click here to finish reading "Dawkins' Ironic Hypocrisy". More On Conspiracy Theories and Emotional "Thinking"
This article will probably cost me some friends. Evolution and selective breeding are 2 different things. Look at what they've done to the German Shepard in the last decade, they,ve changed it's line completely by shortening the back legs. Yes. Selective breeding can be considered micro-evolution under intelligent design. And micro-evolution does occur in nature, within genetic limits. It doesn't "change into something else". Dogs don't give birth to cats. Ah crap I give up. Yeah yeah, we just suddenly appeared with dinosaurs. The gospel according to Fred Flintstone. So, you're going to be insulting and resort to straw man arguments? Good, it's best that you give up. Especially when science is working against you. No, it's more like giving upon arguing with a schizophrenic who insists that the voices are real. You have no interest in real science and would rather believe that an invisible sky man always existed and one day out of all eternity he decided to create billions upon billions of galaxys with untold solar systems just so he could populate ours so his creations could worship him. And all the magic dude can come up with now is showing up as a bad image on burnt toast? No thanks, I'd rather believe in Odin and the Ice Giants, they make more sense than a 6,000 yr old planet. Face it, you gave bad science and extrapolations. When called on your fallacies, you responded with abuse, ad hominems, more straw man fallacies, assertions... let me guess, you're a "thinker", right? Here's a suggestion: Look at the articles linked on this page and see if you can show where the science behind them is flawed. Of course, saying, "They're wrong because they do not support my personal biases and presuppositions" does not count. In another section, he wrote, yeah, it's much easier to believe in magic. Then he experienced the banhammer. Plenty of flaws in logic, lots of emotion, no actual thought. Hilarious! Time to grow up and accept reality. And what scientific reasons to you have for childish ridicule? The fact that science has mountains of accumulated evidence - you have childish stories. Your beliefs deserve all the ridicule they get. Using grown up words doesn't excuse the fact you have a childish belief system. See ya later chuckles, I have better things to do with my time....like being part of the real world. This is part of the reason that the modern atheist movement is failing: They are obstreperous, recalcitrant, vituperative and lacking in the ability to reason. I doubt that they think that people will be swayed by their invective. Instead, I believe that they want to build up their egos by attacking other people. It seems that lately, I have been encountering some intelligent, well-reasoned people who inexplicably shut off their brains in order to believe the most ridiculous things without evidence. 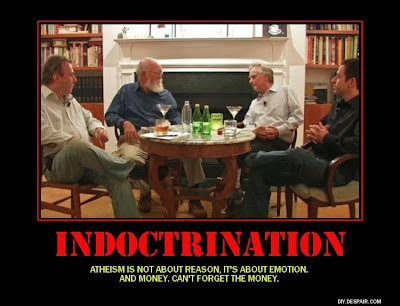 They are able to refute atheism with logic and on a philosophical basis, show fallacies in evolution, give sound theological and scientific reasons to believe what Scripture says about a young Earth, but they believe really goofy things. Especially conspiracy theories. When they believe that stuff, I think it taints their presentations of things that are true — and important. The 9-11 "Truthers". There are variations, but they believe that the US Government intentionally killed over 3,000 of our own people in a "war for oil". This crap is very, very irritating to me because it is so mind-numbingly stupid! It has been disproved for years, and even without reading the refutations, a regular guy can realize the logistics of keeping so many people quiet for so long, and the nature of the human conscience — it's astonishing to me that anyone can believe that rubbish. And offensive because they are impugning the characters of many good people. King James Onlyists. Again, there are variations on this belief, but these people reject valid textual analysis and scholarship to affirm that the King James Version is "the one true Bible". Some go as far as to say that all the other Bibles are "New Age", corrupted, Satanic and those of us who use them are either deceived or actively furthering the Devil's plans. This means that all of the people involved in translating the NASB, NIV, ESV, WEB, HCSB and even the New King James version, among others, are all evil wicked bad nasty people in Satan's service! The horrible a priori "logic" of comparing other versions to the KJV as the standard, and if the other versions differ, they are bad. Further, some KJV-Onlyists have actually lied to get people on their side. You people alarm me. By the way, this is not about preference. If the King James Version is your Bible of choice, you like it best, fine, go for it. Paulbots. This is a disparaging term for Ron Paul supporters. When I listen to a Paul supporter call a Conservative talk show, they preach like Obama zombies about how Ron Paul is going to save the world, how Romney is just as bad as B. Hussein Obama, deny anti-Semitic remarks and writings from Ron Paul, disparage Israel, bash George W. Bush — but do not offer anything of substance. In addition, they have their own conspiracy theories, such as "Ron Paul is actually winning, but people in power have already decided that Romney is going to be the candidate so votes and delegates are being hidden". Sure, Pal. I know people who believe all of the above, and more, yet profess to be Bible-believing Christians. Amazingly, they act like angry atheists when promoting their views! That hurts their credibility. It is indeed unfortunate that people will "think" (and vote!) with their emotions instead of their minds. Now, I know that emotions are a part of who we are. But we cannot let our feelings run the show for us. 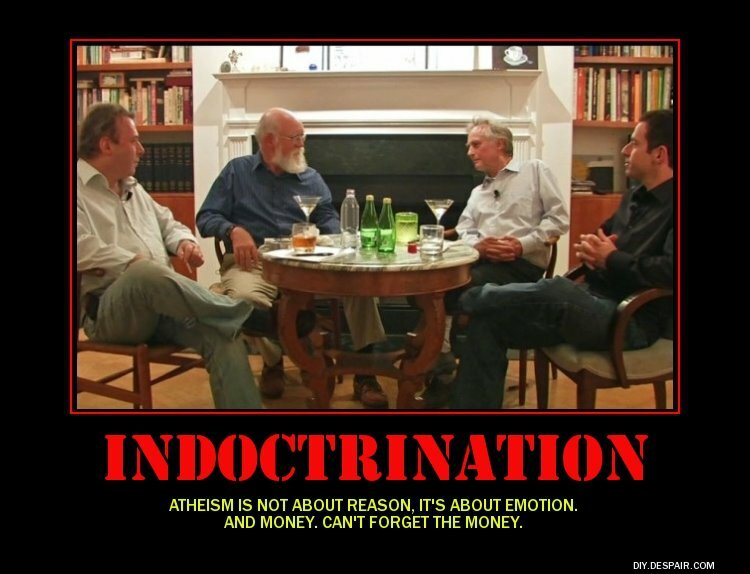 Heating It Up for Atheism in July continues with some reminders that atheism is, indeed, a religion. 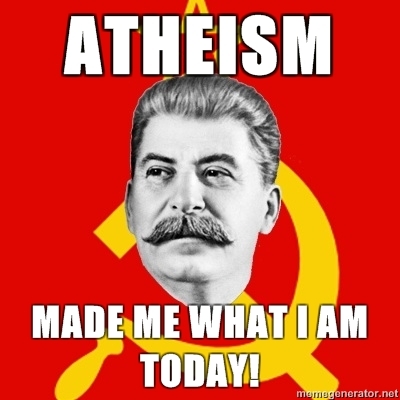 Let's also face that atheism is a worldview, a way of life and (for many) an excuse to hate people who refuse to disbelieve. Here are two embarrassments for those who hold to the intellectually dishonest claim that atheism is a "lack of belief" [1, 2, 3]. First, the "First Church of Atheism", where you can be an ordained clergyman and use it as a means of making money . If that isn't embarrassing enough, British atheists are building a temple of worship . Of course, they'll be worshiping their own egos, since they deny the true and living God. So, in addition to showing how atheism is philosophically and intellectually bankrupt, we can show that the atheistic worldview is also hypocritical. Make It YOUR Independence Day! Here is a great song, and someone did a great job on the fireworks to make the video. We are sure of where we stand. We've found the light of hope in a dying world! "You're the god of your own land". Say you've given up your right to rule. Freedom came when I gave it all away! That's why I call it independence day! But I believe in a better dream. But the biggest chain I knew was me. Let the idols tumble down! — White Heart, from the 1991 album "Power House"
Despite the efforts of revisionists to take away the truth and secularize America, the fact remains immovable that this country was founded on Christian values. Although this country was founded on the Bible, there was never a threat that people would be forced to worship at a state-run religious establishment; people were free to believe or disbelieve as they chose. Americans would do well to remember this as we celebrate the anniversary of our independence. As the nation celebrates American liberty on the Fourth of July each year, it would be appropriate for all Americans (including those who have come here from other nations in search of that same freedom), first of all, to reflect on the Christian foundations—including genuine creationism—on which our nation was built. 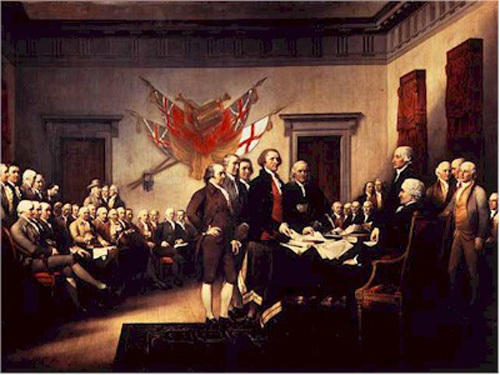 In a previous article on this theme (see the July 1996 Back to Genesis article, “Sweet Land of Liberty”), it was noted that many of the founding fathers of our country were strict creationists and that this fact was reflected in the Declaration of Independence itself. In this article, several more testimonies are cited in support of this vitally important fact. You are encouraged to finish reading "America's Founding Fathers and Creationism", here. Why do atheists and their bed partners like the ACLU seek to destroy anything "religious" in public life? It is usually under the guise of "separation of church and state", a horrible misrepresentation of liberty. When Jessica Alquist sued a Rhode Island school because it had a prayer banner that had been standing for fifty years, something the townspeople loved, misotheists hailed her as a hero and gave her a $40,000 USD "scholarship" . And they really wonder why they are the least-liked group? So where are these guardians of freedom when the state, under marching orders from Obama zombies, directly infringe on the Catholic Church ? They claim that they want liberty and equality for all, but their conspicuous absence in this blatant attack on religious freedom illustrates their hypocrisy. And they really wonder why they are the least-trusted group [3, 4, 5]? Add to this their obnoxious attacks on Christians, and it should not be a mystery to any rational person. Thought this was ready to go, but I have a new development. A certain obscure, misotheistic, anti-creationist Page on Facebook is called "Exposing Dishonesty in Creationists". Yet again, someone is using an appeal to emotion to manipulate, and is unwilling to see that disagreement on the interpretation of facts is part of the spirit of scientific inquiry. To accuse someone of lying is outrageous. Perhaps this guy is unaware of what lying entails ? Further, he compiled a "List of People to Investigate". A bit Stalinesque, Comrade? The Thought Police in action, making sure that the world is safe for evolution, a foundation of the religion of atheism? No, atheism is not conducive to liberty. Quite the opposite, in fact. Instead, liberty comes from God. Heating It Up for Atheism in July continues with a review of the propaganda piece aimed at children by Richard "Daffy" Dawkins called The Magic of Reality. As usual, his misotheistic material is aimed at undermining the faith of people by using straw man fallacies, arbitrary assertions and appeals to emotion. Read between the lines: "Don't trust your parents, kids! If they deny evolution, they're lying! Come to me, I have the truth." Propagandist. “From first to last it is a dish of rank materialism cleverly cooked up … . And why is this done? For no other reason, I am sure, except to make us independent of a Creator." Others have reached a similar conclusion. Read the rest of "A review of The Magic of Reality by Richard Dawkins", here.